The opinions expressed in the studies below are those of the authors and do not necessarily reflect the views of ERA. Arcadis has been tasked to analyse the overall situation of existing CCS equipment (e.g. 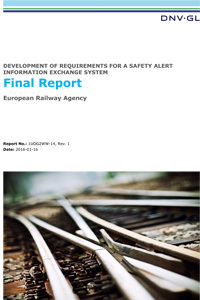 interlocking, block and traffic management systems) concerning its expected life cycle and its renewal while embedding the ERTMS migration. 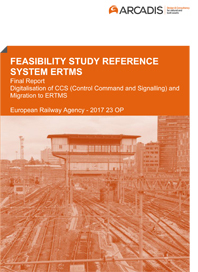 The Arcadis study will support the Agency in its mid-term and long-term strategic reflection to further improve the conditions for the ERTMS deployment. 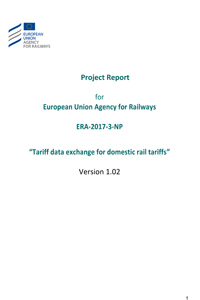 Independent researchers from Steam Intellect have conducted a study to test if the standard NeTEx (CEN/TS 16614-3:2014) may accommodate the domestic and cross-border railway tariffs in the Member States of the European Union, and to identify if a harmonised data exchange for those tariffs can be established. 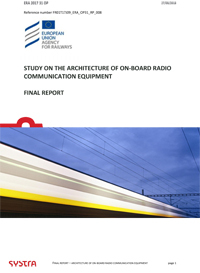 In the framework of the Agency’s radio evolution project EVORA, independent contractor Systra has been tasked to identify the possible impact of the evolution of railway radio systems on on-board radio systems. The first part of the study is addressing the overall system architecture, while the second part is focusing on the impact of different aspects on on-board equipment. 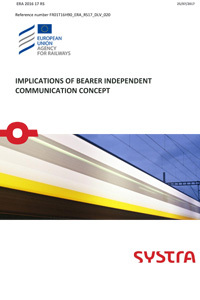 SYSTRA conducted this study on behalf of the European Union Agency for Railways (ERA) in order to provide a working definition of bearer independence in preparation for future work; and to identify conditions for railway infrastructure, for vehicles, for spectrum, and for related equipment that could potentially enable European railways to achieve bearer independence. 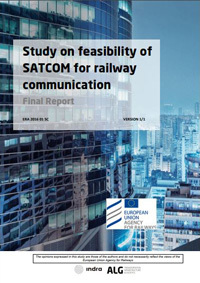 This is the executive summary of the Final Report for the ―Study on feasibility of SATCOM for railway communication‖, which has been conducted by Indra and ALG for the European Union Agency for Railways over the period June 2016 – February 2017. The goal of this report is to verify the implementation of 44CRs in the EVC software. 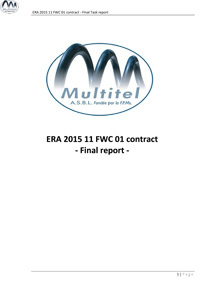 39 test sequences have been created by Multitel to verify the new behavior expect by the SRS 3.6.0. 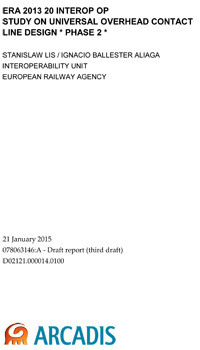 The purpose of this study is to provide assistance to the Agency in the economical/financial areas related to the new tasks of the Agency under the technical pillar of the 4th Railway Package (4RWP). 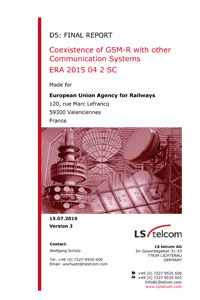 The scope of this study is to analyse if the frequency bands “876-880 / 921-925 MHz” and “873-876 / 918-921 MHz” (ER/R-GSM spectrum) can be shared by other radio communication systems for railway use in coexistence with the existing GSM-R system operated in these frequency bands. 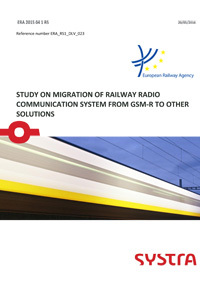 The European Rail Agency (ERA) commissioned Systra to conduct a “Study on migration of railway radio communication system from GSM-R to other solutions”, project ERA 2015 04 1 RS. This is the Executive Summary of that study. 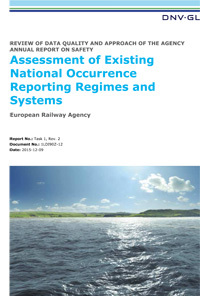 The European Railway Agency (ERA) is in the process of implementing a temporary system that will allow actors to rapidly share information about new or increased common risks on the railway. 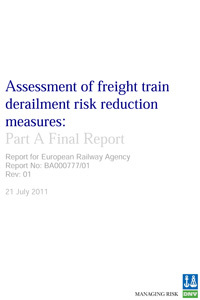 The objective of this system is to inform actors about the existence of such risks, enabling them to revise and improve their own risk management methods and thus potentially avoid accidents. 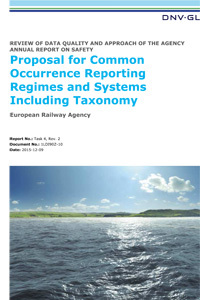 The impact assessment supports a recommendation for the introduction of a mandatory occurrence reporting regime for all Member States and the collation of consolidated occurrence reports at an EU level by a central body. 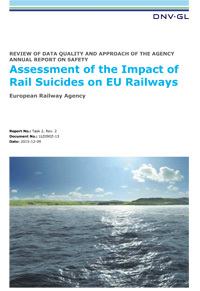 The objectives for the suicide reporting element of the study were to determine the means by which railway suicides are reported, what is the real impact of suicide events on railways in the EU and whether there is a need for any action at the EU level. 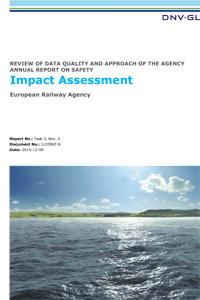 This report addresses Task 1 of the project Review of Data Quality and Approach of the Agency Annual Report on Safety. 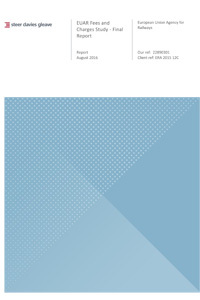 This comprised gathering information on the existing occurrence reporting regimes utilised in the Member States. This report provides the summary of discussions and the conclusions of each agenda item for the workshops on Suicide on Railway Premises and Common Occurrence Reporting, held at the European Railway Agency (the Agency) premises in Valenciennes on 28th and 29th October 2015. The European Railway Agency (the Agency) has commissioned DNV GL to undertake a short screening exercise to review relevant risk models used in the railway domain and in the oil/gas and aviation sectors. 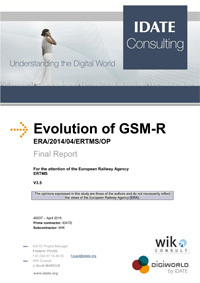 This is the draft Final Report for the study “Evolution of GSM-R”, study ERA/2014/04/ERTMS/OP6, which is being conducted by IDATE and WIK-Consult GmbH for the European Railway Agency (ERA).The document is published in the interest of soliciting feedback from interested parties, and to support future planning on the part of the ERA in particular and the European rail sector in general. The current study of ANA_3 & ANA_4 has the objective to develop a standard method for Inframanagers to assess the chance of dewirement and infringement on local infrastructures. To achieve the objectives, all factors that determine the position and movement of the related systems are examined. 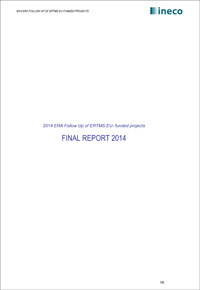 The aim of this Final report is to describe the status of the projects and the activities performed by Ineco for the technical follow up of ERTMS projects funded by the EU during 2014. 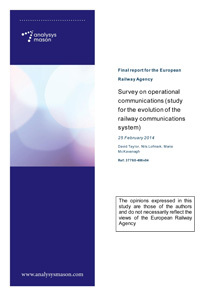 This document captures the findings of the study into operational communications for railways: ‘Survey on operational communications (Study for the evolution of the Railway Communication System)’ carried out by Analysys Mason for the European Railway Agency (ERA) over the period August–December 2013.